The Federal Communications Commission (FCC) is charged with regulating interstate and international communications by radio, television, wire, satellite and cable. The FCC may penalize licensees for knowingly broadcasting false information. If you would like to contact the FCC, or file a complaint, the applicable information has been added to FNB. FNB is able to offer visitors 25% off The Weekender from the New York Times, plus a FREE $25 Amazon gift card. The Book Store and Clothing page have been added to a new FNB Store section, which now includes a Stickers page and one for the TV-B-Gone. In appreciation for the support by visitors who leave comments, a new feature has been installed to provide some love, CommentLuv that is… Now, bloggers can get an additional link to a specific blog post when they leave a comment, giving more incentive to take part in, or start, conversations. This will be a trial run. If spam increases, or the quality of comments degrades, the feature may be disabled. Glenn Beck invaded my commute via a radio commercial for Goldline International, Inc., one of those gold buying/selling sites offering “investment kits” and whatnot… According to their Corporate Information page, Goldline International, Inc. became the exclusive precious metals sponsor of the Glenn Beck show in 2008. It also appears that they are the exclusive sponsor of Glenn Beck’s comedy show. So, they’ve been added to the list of Fox News sponsors. FoxNewsBoycott.com has been upgraded. I think, for the most part, it went okay. Please comment on this post if you see any errors or problems that need to be fixed. Thanks! Apparently, the server FoxNewsBoycott.com is hosted on experienced a drive failure and the site had to be moved to a new server. Unfortunately, the last backup did not include the posts and comments made yesterday. Today, I’ll have to spend some time redoing what I can… I apologize for any inconvenience this may have caused. In addition on the book store on FoxNewsBoycott.com, you can now find a wide selection of anti Fox News clothing, including t-shirts, long sleeved shirts, sweatshirts, hoodies, hats and more! There are many popular designs to show your displeasure about Fox News, such as “Faux News,” “Hoax News,” “Fox Lies,” etc. 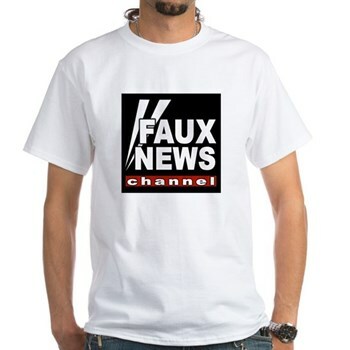 Here’s a sample Faux News t-shirt. Click here for more! FoxNewsBoycott.com hit the front page of Digg for Janeane Garafalo handling the ambush on Fox News. The site is under a decent load right now, so I’ve installed and activated the Super Cache plugin, which should help… So, welcome Diggers! Please be sure to review the FoxNewsBoycott.com Comment Policy. It is not intended to be a means of censorship; however, in order to provide a more valuable resource, posts are moderated to keep discussions on topic and free from spam and harassment. I don’t know what classes, if any, are available at the Fox News Channel University, so here are some I imagine one could take.